As I have spent more time traveling over the past several months, I’ve settled on a set of must-have electronics that make the logistics a lot easier. I thought I would share some of my favorites. Usually, the first rule of traveling is the keep things as light weight as possible, but I have found that the opposite is true for your iPhone charger. The usb charger that Apple ships with each iPhone is small and portable, but its output is also just 5 watts. This is fine for plugging in overnight or if you can stay put for a few hours. However, when you are traveling, you often don’t have these kinds of charging luxuries. Your phone is working overtime as you rely on it for both data connectivity and directions via GPS. Your days are much longer, as you get up earlier than normal for an early train or catch a late flight home. It’s not uncommon to find your phone running uncomfortably low on battery. While you are grabbing a quick dinner at the airport or waiting 15-20 minutes for your flight to begin boarding, you might spot an available outlet to plug in. Sadly, that 5W charger just won’t do a lot of good for a quick charge in this situation. You might get a couple of percentage points back, but it won’t help much. For these situations, I have taken to traveling with an iPad charger instead of the ones meant for an iPhone. It takes the same USB lightning cable that works with the phone, but it delivers a lot more power: 12 Watts. For just a little more weight and bulk, I can drive a lot more electrons in the the phone’s battery during these short charging windows. The design of many hotel rooms kind of baffles me. There just aren’t enough plugs for all the gadgets I travel with. I have a laptop, an iPhone, an iPad, and a bluetooth headset, but more often than not there are hardly any plugs. The ones that are there are many times hidden behind nightstands or unhelpfully located in the bathroom. It’s a real hassle trying to plug everything in. For these situations I always travel with an ultra slim usb charger. I stumbled on this device at a Rite Aid with a Philips label, but I have found it under other sellers, including someone called XTG. 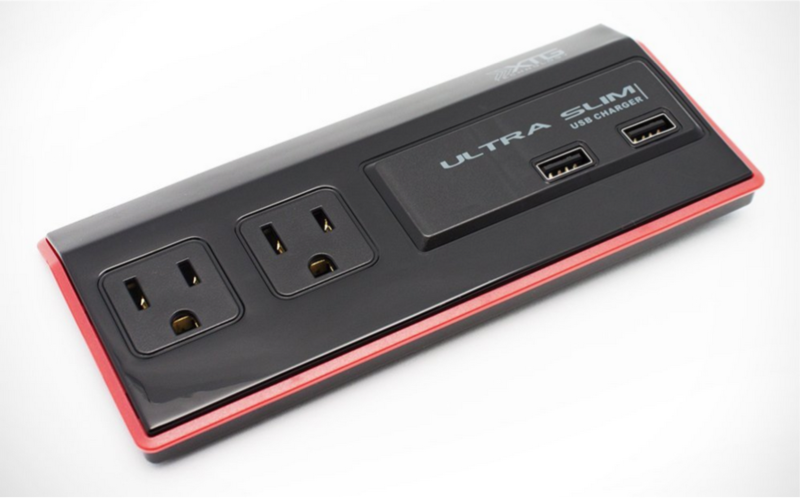 This charger is completely flat but provides two power outlets and two USB ports. It’s an amazing device. It’s completely flat and folds to just a half inch thick, which makes it easy to slip into a laptop bag. However, a plug pops out the back to plug it into a wall plate. It then provides two well spaced AC adapters and two USB adapters. From just one plug, I can hook up my computer, my iPad, my iPhone and my USB headset. The USB ports don’t provide enough amperage to charge an iPad, but they will work for smaller devices like an iPhone or a bluetooth device. The other nice thing about this device is it allows me to split any plug. If I am desperately searching around for a place to charge my phone at an airport but all plugs are taken, I can ask to share someone’s plug by using this device to “split” one plug into two. Another very handy item to carry around is a really short extension cord… just 12 inches! Apple products are nice, but when you bring the MacBook’s travel charger, it doesn’t always fit so well into the available plug. Many AC ports in conference rooms are recessed into the table for aesthetics, and sometimes the weight of the charger pulls it out. A nice, short 1 foot extension cord has a nice narrow plug that you can fit into even the most cumbersome AC outlets. It’s also quite handy when the one available outlet in the hotel room is behind the bedside table. I often use this in combination with the ultra slim USB charger (above). I generally rely on loading up my iPad or iPhone with some movies or videos to relax, and when I am in a hotel room in the evening, I can also supplement with streaming video from Netflix or Hulu. Sure, I can watch on the small screens, which is fine for an airplane, but in the hotel room, it feels like kind of a waste. There’s this nice big HDTV just sitting there. Invariably, I have found that these TVs have extra ports in the back, including an HDMI. So rather than watch on the small screen, I just use an HDMI adapter to hook my iPad or iPhone right up to the TV and watch on the big screen. The only catch is that most of these devices have no available cable, so I need to provide my own HDMI cable, which is bulky. 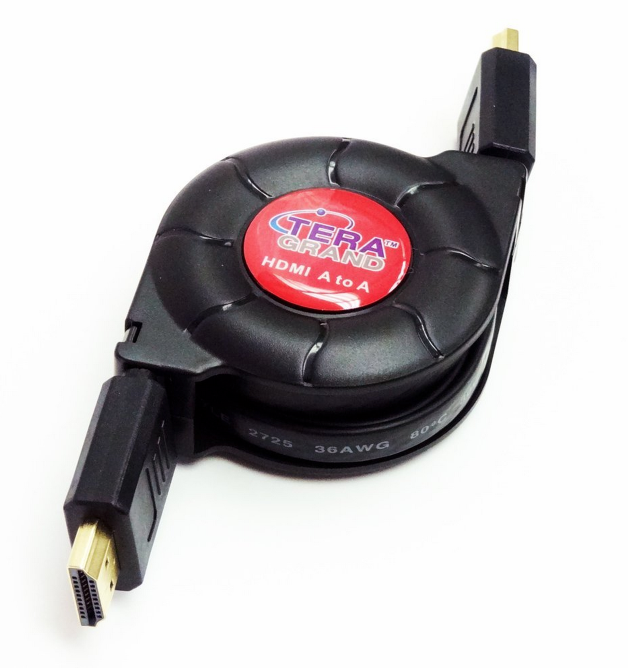 This retractable HDMI cable is just a few inches wide but expands to over four feet long. I found this nice retractable HDMI cable, which takes up very little space in my laptop bag but lets me watch TV in comfort. 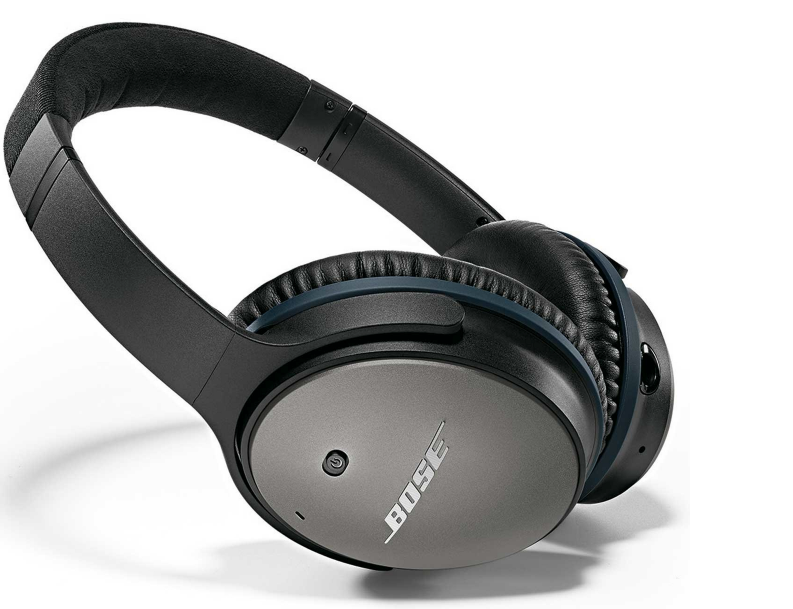 And of course I would be remiss if I didn’t mention my Bose Quiet Comfort 25 noise canceling headphones. They don’t block all noise, but they really take the edge off of the drone of a loud airplane or train. These noise canceling headphones can block out the loud drone of the airplane or the rumblings of a snoring child. I’ve also found that they do an excellent job of silencing the sound of my daughter’s snoring on those nights when she insists of coming into our bed at 4am and cannot be convinced to go elsewhere. This entry was posted in Uncategorized and tagged electronics, iPad, iPhone, location services, travel. Bookmark the permalink.